Neither of these has an easy answer, but for the second question India is surely a finalist if it’s not the winner. If you do it right, India is an unbelievably cheap destination. There’s a qualifier in there though because you also see India spending a fortune on advertising in the glossiest travel magazines, with most of that focus being on the luxury hotel palaces from Oberoi, Taj, and Leela, as well as the $1,000 per night grand train journeys through Rajasthan. If your budget is unlimited there are few places that can pamper you in such regal fashion. For those on the other end of the scale though, that $1,000 can last two or three months instead of one night, and without much effort. India is still a destination where you can travel on $10 a day and have a pretty good time. You’ll have to splurge now and then for places like the Taj Mahal, but when an all-you-can-eat meal is less than $1 and you can get a private room for a few bucks a night, a couple can average its costs out to $15 a day. It won’t always be comfortable at that level, but you can see a lot that’s worth seeing and stay nourished. A backpacker couple spending $30 to $40 per day can enjoy better train tickets and hot water hotel rooms, while spending more than $50 a day can take some real effort in some areas, especially in the far north or the far south. 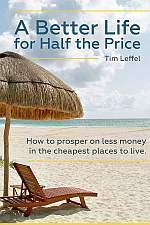 If you have $50 to $100 per day per person budgeted for a vacation, your will not have any money worries In India unless you’re doing a short tourist loop and trying to stay in top hotels. There is a lot of seasonality to pricing in India though. It’s not uncommon for hotel prices to double or triple when high season hits in a place like Goa, then drop back down in slower months. Study that “when to go” part in the guidebook carefully for specific regions when making plans. Kerala tourism prices are more consistent throughout the year, as are places that are more removed from the main tourist itineraries. It’s hard to give typical costs for India though except on standardized things like train tickets. This is because prices in the main tourist areas and the big cities are far higher than prices in places that are off the organized tour routes. For the extensive train system, an overnight sleeper can be less than $5 in second class for shorter routes. An air-conditioned first class sleeper is roughly 2-1/2 times the price of second class. Still though, that can mean just $20 instead of $8, which is an easy splurge to justify sometimes. Meals range from 50 cents to $2.50 in a basic restaurant. It’s hard to believe until you’ve experienced it yourself, but a thali meal like the one pictured at the top of this post will come in under $1 at a cheap place in southern India, or $2 in a nicer “businessman’s restaurant.” Spend $10 here and you’ll be getting pressed tablecloths and four courses served by waiters in tuxedos. Alcohol is no bargain, but samosas, chai, and snacks are almost free. Room prices are the biggest variable. You may actually still find a decent private room for a buck somewhere, but in Bombay or Bangalore you could pay more than $20 for something bearable. Spending as little time as possible in the big business centers is a wise move and chilling in a mellow area for a few days or a week can do wonders for the budget. The only problem is that it is incredibly expensive to get there. I don’t think I’ve ever seen airfare drop below $1300. Off season travel to Europe, Asia, even Australia can be as low as $500. But flights to India are never cheap. You’re right. It’s best to hit India as part of a round-the-world journey than it is to go there on vacation. Because then you can get in from a closer country on a cheap flight. A round-the-world trip is not a whole lot more than just that flight to India from the U.S. Same for most of Africa, unfortunately. As usual, this article summarizes our experience. Also your comment about adding India as part of an around-the-world ticket can really minimize the airfare costs. We flew from Saigon (Ho Chi Minh City), Vietnam to Chennai in Southern India (via Singapore) for $150 each, inclusive of taxes. I thought this was a great deal. 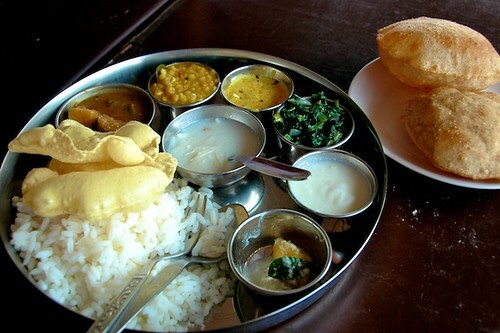 And we haven’t gotten sick of the above pictured $1 thali meals! So yummy and filling! I’m a real big fan of Indian food (assuming I actually know what real Indian food is) and the idea of going on holiday there and spending only a little for some fantastic meals is really tempting. i can not believe you can get that much food for $1 in india. although i got about the same deal from a street vendor in hue, vietnam. 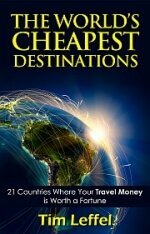 Great Information about cheap ways to India. India is known very well for its tourism places. Here are lot of places for traveling at cheap cost so that visitors can enjoy with fun. Jaipur is one of beautiful place for tourism in India. Jaipur is famous for its many historical places. Here are lot of heritage hotels with Restoration facility at cheap cost. India is great historical, religious and cultural country in World.So it is always proud for it. India is a huge country with an plenty of tempting magnetism — mountains, desert, beaches, scenery, temples, and the past — sprinkled from one side of its soil to the extra.In this country Orissa is most important. It is situated east state of India.Orissa, the land of Historical,it is one of the most sought after tourist destinations in India. It wasn’t true for my wife or I. We traveled to India for two weeks in March of 2010. As soon as two “Americans” were seen entering any establishment — the prices were raised. More then once, locals who spoke English would share with us their local price as compared to our tourist price. The local price is comparable to the story, our prices were comparable to Chicago, Illinois. India is a very cheap place to travel. Trains in india are very comfortable and cheap to travel on. Besides that food is really cheap but it can be some good comfortable hotels which can be a little bit expensive. But overall India is a cheap place to travel. I think people need to understand that sometimes where you come from matters a lot. For example if you are coming from UK or USA you really can travel cheaply but if you are coming from some country which has low currency, it is a totally different story. I love indian food. very informative post for travellers those come to india for indian food. You have provided some amazing facts about India. Offcourse, India is a cheap travel destination with places like Dharmshala and Varkala. If you ever visit Kerala never miss out Varkala, the cliff beach destination. I love Indian food. if you are searching cheapest tourist place in the world, India is the first option. I have travel India’s most visited tourist places like Kerala, Himachal, Uttrakhand, Nadaman etc. Great Thank for cheapest places in India and I am so happy to find lovely places delicious food sport in India.